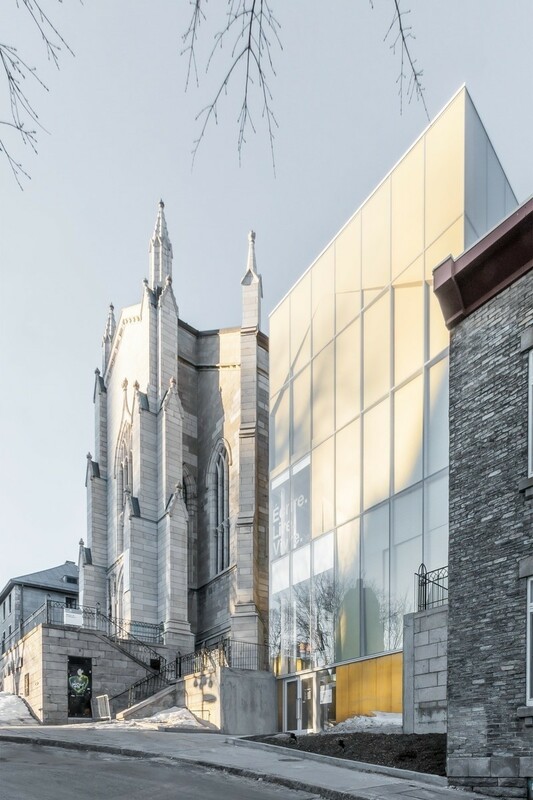 After many months of work, construction of the Claire and Marc Bourgie Pavilion of Quebec and Canadian Art at the Montreal Museum of Fine Arts (MMFA) and restoration of the 1894 heritage church, which has been converted to a 444-seat concert hall, have been completed. Both the schedule and the budget have been respected. The Museum’s curators, led by Nathalie Bondil, the MMFA’s Director and Chief Curator, will soon begin the task of installing the 600 works in the six new floors. The new pavilion will open to the public this fall. 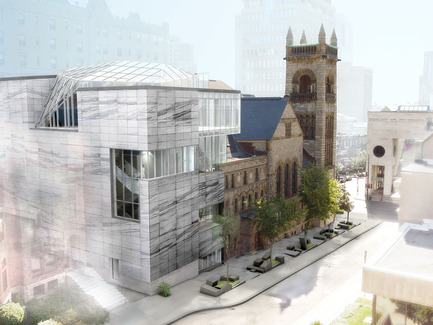 The Museum, which celebrated its 150th anniversary in 2010, is expanding once again, thanks to the unwavering determination of the Museum’s former Chairman of the Board, Bernard Lamarre, who initiated the project, and Brian M. Levitt, the current Chairman. The addition of this fourth pavilion will more than double the area devoted to Quebec and Canadian art. 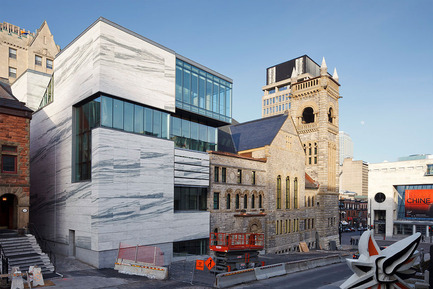 In this new building (which has already received two awards – the 2010 Canadian Architect Awards of Merit and the 2011 Award of Excellence from the Urban Development Institute of Quebec), the Museum will soon be presenting a unique and coherent look at the history of Quebec and Canadian art. With admission and audioguides free of charge at all times, the new Claire and Marc Bourgie Pavilion will give thousands of visitors, school groups, families and tourists an opportunity to learn more about our heritage, which will be shown here in a historical context. 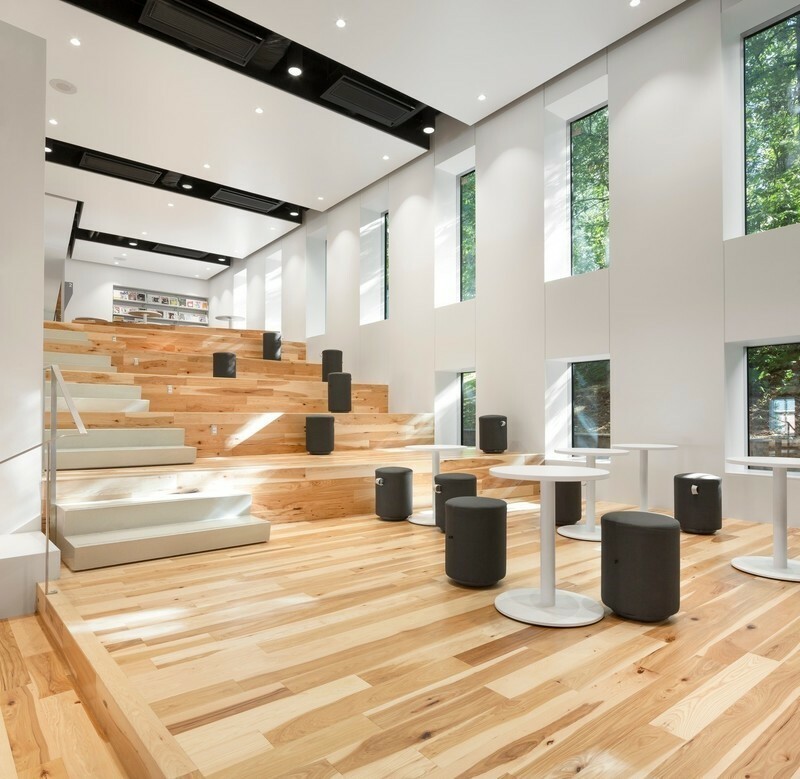 The Bourgie Concert Hall, which will present numerous concerts and activities every year, will help spark a new dialogue between the visual arts and music. 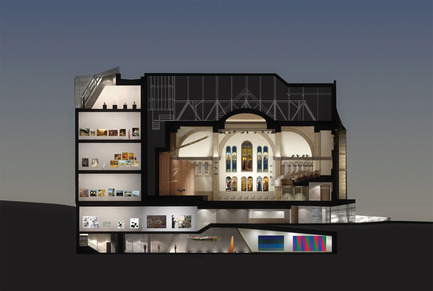 This innovative expansion project includes a heritage building, the Erskine and American Church, deconsecrated in 2004 and acquired by the Museum in 2008. 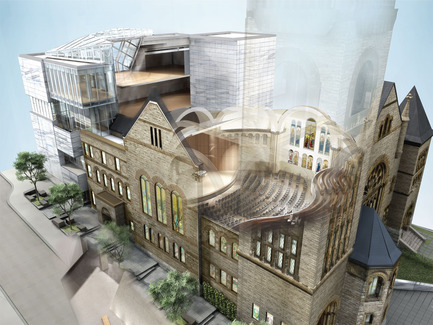 With this acquisition, the Museum embarked on a project that is unique in Canada: on one hand, a pavilion with a resolutely contemporary look, on the other, a concert hall in a Romanesque Revival building more than a century old. Joining the two buildings together made it possible to preserve a “national historic site.” A model of architectural conversion, it also serves as an example internationally, since few such projects exist. 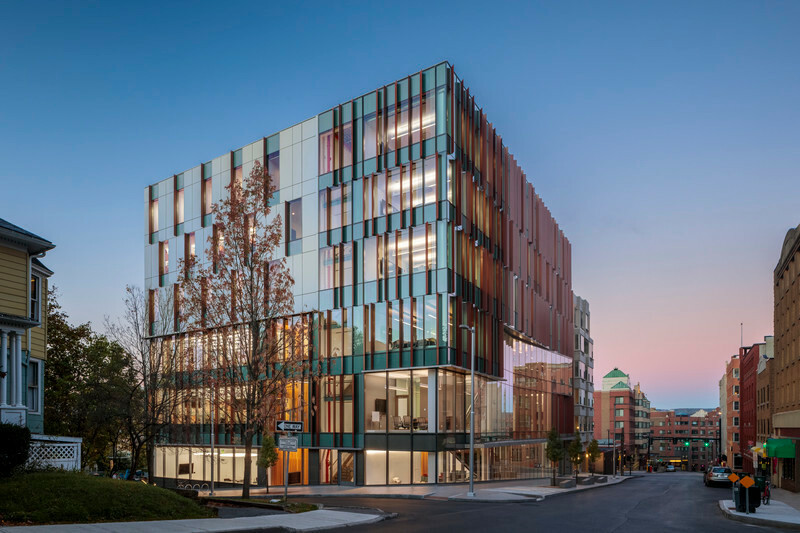 This project, which called for an ingenious design and presented complex engineering challenges, was assigned to Provencher Roy + Associés architects, and led by Claude Provencher and Matthieu Geoffrion, who worked with 450 professionals and craftsmen on this huge building site. The basic premise was to combine the museum function with a church built in the late‐nineteenth century. Transforming part of the structure to be able to display works was a necessary choice, since it was not possible to adapt it to meet the museological conservation requirements for works of art. The church had already undergone remodelling, including one in 1938, which involved separating the sanctuary from the other community functions at the rear of the church. Not only is the museum function an ideal fit with the church, giving it a new life, it also makes it possible to conserve a “Canadian architectural treasure.” In awarding its 2011 Excellence Award to the architects of the Claire and Marc Bourgie Pavilion, the Urban Development Institute of Quebec congratulated Provencher Roy + Associés architectes for their in‐depth reflection on the challenges presented by the project, its exceptional urban integration and its design, which brings past and future together. Despite what may at first appear to be a rather architectural eclectic complex – four pavilions from very different eras and with differing structures – attention to the architectural harmony between the new pavilion and the other pavilions was an imperative from the outset and an essential requirement for the architects at Provencher Roy + Associés. They had to find materials that, although specific to the new contemporary section, were also consistent with the existing church and with the Museum’s other pavilions. The white marble used for the Michal and Renata Hornstein Pavilion (architects Edward & W.S. 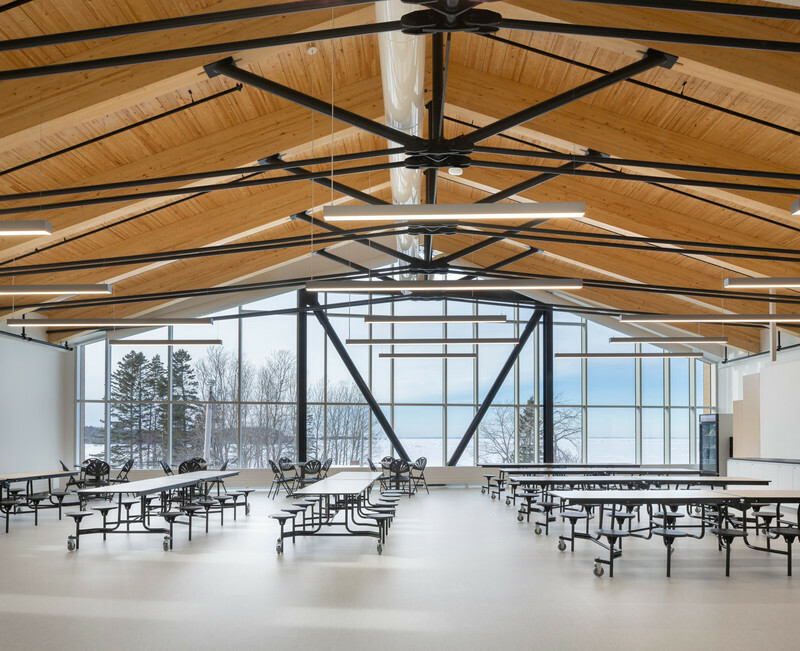 Maxwell) and the Jean‐Noël Desmarais Pavilion (architect Moshe Safdie) was the ideal choice for the exterior of the new pavilion, thereby completing a trilogy with the existing buildings and forming a coherent whole. Marble and walls of clear glass for the fenestration of the new architecture set it apart from the church but are cohesive with the Museum’s other pavilions, the white marble linking them physically and symbolically. The use of marble for the three buildings is also unique in Montreal and in Quebec, where this lavish material is not often used. It comes from the same quarry in Vermont that provided the marble for the Michal and Renata Hornstein Pavilion in 1912 and the Jean‐Noël Desmarais Pavilion in 1991. The 1,500 sheets of white marble covering the outer walls of the Claire and Marc Bourgie Pavilion were installed so that the veins in the marble form a coherent pattern, creating a stone mural. Thus, twenty‐seven successive cuts from sixteen blocks originating in the same wall of the quarry reproduce the same configuration of veins twenty‐seven times. 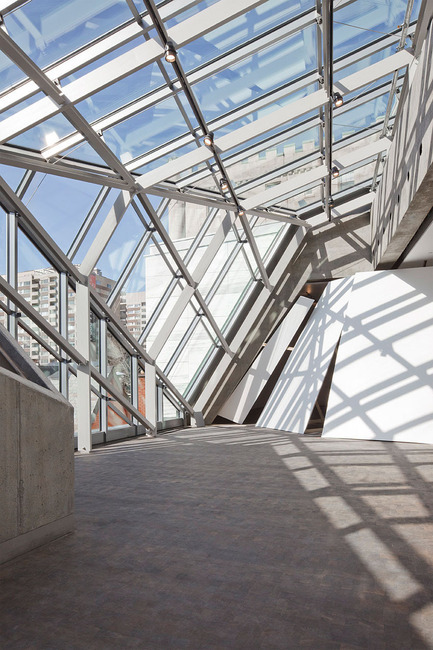 The fourth pavilion adds two thousand square metres of gallery space, more than doubling the area for the presentation of Quebec and Canadian art and increasing the MMFA’s total exhibition space by 20%. 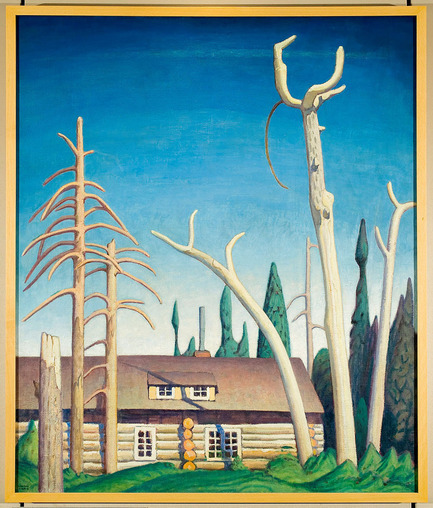 This expansion means that a substantial number of works from the Museum’s outstanding collections of historical and modern Quebec and Canadian art will be on display. With a new installation conceived primarily by Jacques Des Rochers, the Curator of Early Canadian Art, 600 works are presented in the six new floors. The installation design was done by interior designer Daniel Castonguay, under the supervision of the Museum’s Head of Exhibitions Production, Sandra Gagné. 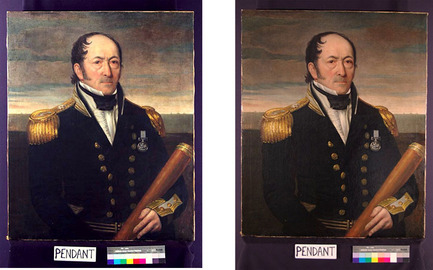 Hundreds of works will now be displayed, including many major acquisitions that were made as part of the Museum’s 150th anniversary campaign and works recently restored or re‐framed. Never before has the MMFA made such an effort to study, restore, exhibit and promote this heritage collection. 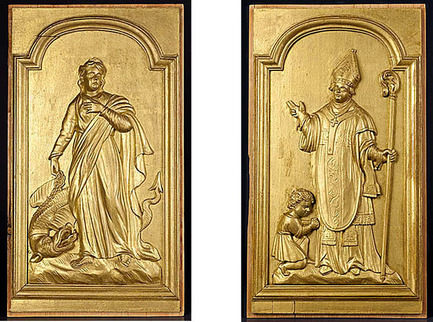 Some 5,000 hours were devoted to restoring a hundred works, under the direction of Richard Gagnier, Head of the Conservation Department. Curators Anne Grace (Modern Art) and Stéphane Aquin (Contemporary Art) are also involved in the installation of this collection in the new pavilion. This new building will house 600 works from the Museum’s Collection of Quebec and Canadian Art (access will be free of charge for all at all times), in a presentation that will be arranged chronologically, from top to bottom: • On Level 4, Inuit art will be presented in the Boreal Gallery, in an area adjacent to a glassed‐in gallery with a panoramic view of the mountain, where private events can be held. • Level 3, with the theme Founding Identities, will feature works from the colonial period (1700s to 1870s) associated with the origins of Canadian art, dominated by portraiture and religious art, with the subsequent emergence of a school of landscape painting; the presentation of historic and contemporary Amerindian art will provide a critical, retrospective look at their contact with Euro‐Canadians. • On Level 2, visitors will discover the Annual Exhibitions era (1880s to 1920s) associated with such artists as William Brymner, Maurice Cullen and Marc‐Aurèle de Foy Suzor‐Coté. This section will also dedicate space to major artists like Ozias Leduc, James Wilson Morrice and Alfred Laliberté. • On Level 1, Towards Modernism (1920s to 1930s) will feature the first groups of modern artists: in Montreal, the Beaver Hall Group, which explored Quebec cityscapes and rural landscapes and the human figure; in Toronto, the Group of Seven, which acted as a standard bearer for a national identity through their depictions of the Canadian wilderness. There will also be special gallery space devoted to Marc‐Aurèle Fortin. • The Sherbrooke Street level will present the Age of the Manifesto (1940s to 1960s), where visitors will see exceptional works by artists like Alfred Pellan, Paul‐Émile Borduas and the Museum’s rich collection of works by Jean‐Paul Riopelle, from 1947 to 1977, which will be featured in a special gallery. • The «Mountain Gallery», the underground gallery linking the Claire and Marc Bourgie Pavilion to the Museum’s other pavilions, will feature the theme Expanding Fields (1960s‐1970s). Here, visitors will discover imposing works by Louis Archambault, Greg Curnoe, Jean Mc Ewen, Guido Molinari, Michael Snow and Claude Tousignant, among others, in a space leading to the Galleries of International Contemporary Art in the Jean‐Noël Desmarais Pavilion. 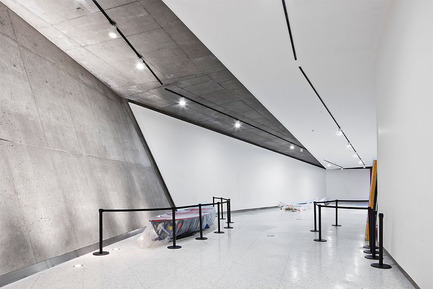 This vast, forty‐five‐metre‐long gallery will be used for the installation of monumental works, like Riopelle’s gigantic Ice Canoe (1992). 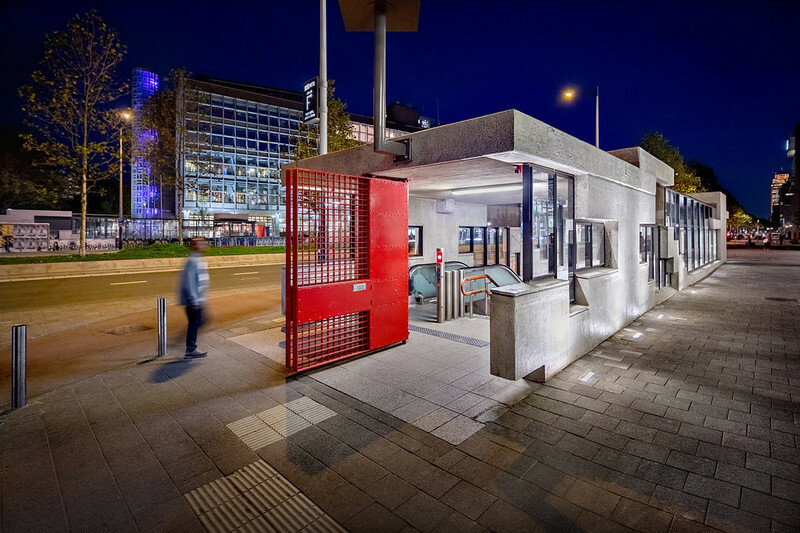 The Museum planned the project based on recommendations by Jean‐Claude Marsan, urbanist and architect, in his 2006 heritage study. The heritage church to which the new pavilion is attached has been restored in order to conserve the building’s Romanesque Revival architecture, which echoes the massive, powerful style of early Medieval churches. This building, designed in 1894 by Montreal architect Alexander Cooper Hutchison, is a rare example of the Romanesque Revival style in Montreal. Designated a «national historic site» by Heritage Canada in 1998, for its history and its remarkable architecture, this Church is notable for its imposing façade, an ingenious combination of heavily rusticated grey limestone and lavishly sculpted brown Miramichi sandstone, make it a unique composition in Montreal. By the end of this project, each of the stones will have been restored and cleaned. The majestic dome characteristic of the Byzantine style is also very unusual in Montreal churches. 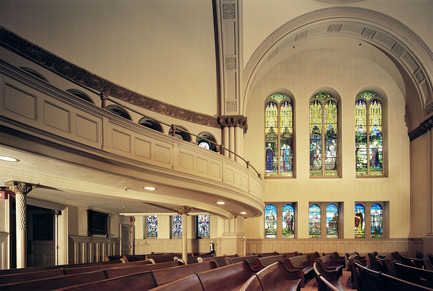 The twenty Tiffany windows, which are now part of the Museum’s collection, were commissioned at the turn of the twentieth century for the American Presbyterian Church on Dorchester Street (now demolished). 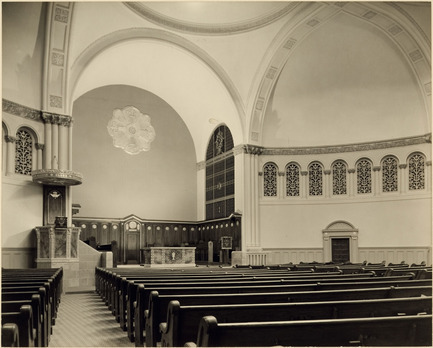 They were then reinstalled in the Erskine and American Church on Sherbrooke Street in 1938‐1939. Seventeen of these windows were created during the heyday of the Tiffany Glass and Decorating Company in New York, between 1897 and 1902. 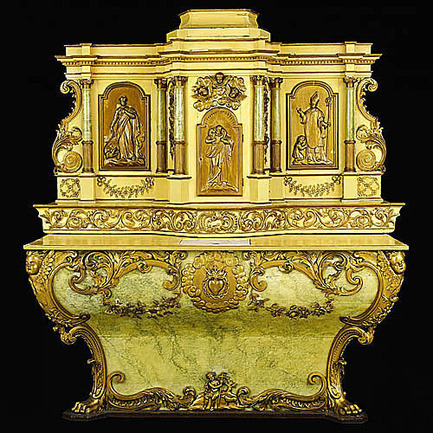 Their quality was confirmed by two leading Tiffany experts – Alice Cooney Frelinghuysen, curator of American decorative arts at the Metropolitan Museum of Art in New York, and conservator Thomas Venturella, a master American glass craftsman. The ensemble was one of only two commissions by Tiffany in Canada and one of the few surviving religious series in North America. It is without a doubt the most important collection of its kind in the country. Four of these outstanding double lancet windows are enormous: nearly four metres high and 1.5 metres wide. Following research conducted by Rosalind Pepall, the Museum’s Senior Curator of Decorative Arts and under the supervision of Richard Gagnier, the restoration work was carried out in Montreal by Françoise Saliou and Thomas Belot of Atelier La Pierre de Lune. The restoration of the Tiffany windows of the Erskine and American Church was the largest such project ever undertaken by the Museum, necessitating more than 5,000 hours of work and direct investments of more than half a million dollars. Today, after more than half a century in obscurity, this priceless Montreal and Canadian heritage treasure has at last been made accessible. 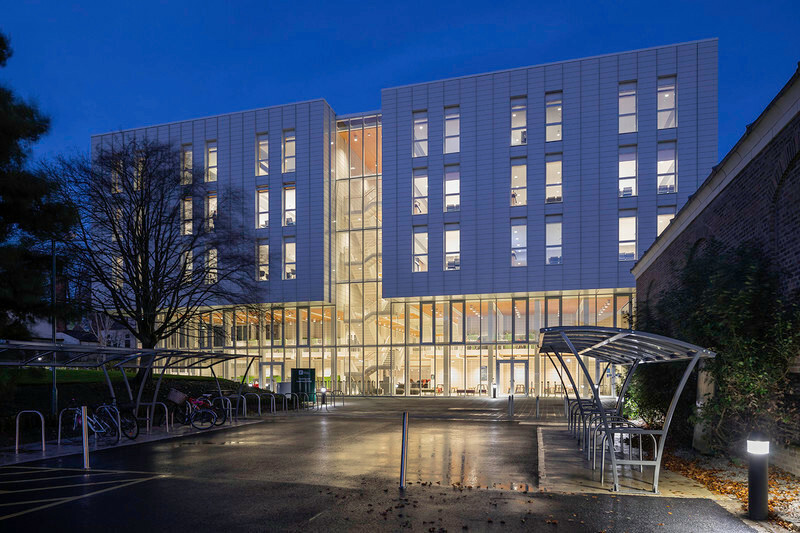 Since Museum management wanted to allow music lovers who attend concerts and Museum visitors who stroll through Bourgie Hall to truly appreciate these windows, it installed an innovative system of permanent backlighting, the first to be carried out on such a scale. In all, 118 stained glass windows were also restored and reinstalled in the new concert hall. 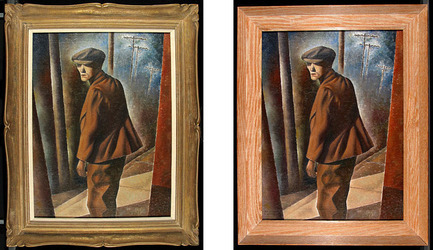 Of particular interest is a six‐panel window in the narthex, a 1939 commission by Charles William Kelsey depicting views of Montreal and the Saint Lawrence from the Westmount summit. A large half‐rose window above six lights depicting biblical figures, created by Peter Haworth in 1938‐1939 can also be admired. Already renowned for its acoustics, the church’s nave has been restored and transformed into a 444‐set concert hall, as well as an exhibition space for the many stained glass windows in the Museum’s collection, which will be the subject of guided tours given by the Museum’s Volunteer Guides and the audioguide that will be offered to visitors free of charge at all times. More than a hundred concerts will be presented there every year, along with educational and cultural activities associated with music and the fine arts, screenings of HD films and special events. Its size makes it perfect for chamber groups and other small ensembles such as string orchestras. The music presented in Bourgie Hall will range from early music to contemporary fare, including jazz and world music, to give audiences access to a wide range of musical experiences related to the Museum’s encyclopedic collection. Bourgie Hall, named in honour of Pierre Bourgie, the patron and the mastermind behind the Arte Musica Foundation which is directed by Isolde Lagacé. 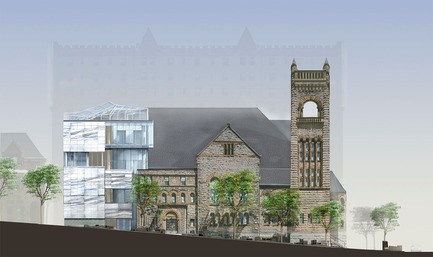 The concert hall will also open in the fall of 2011. The quality of the acoustics have been improved on (Go Multimédia for the stage and electronics, and consultants Legault Davidson for the acoustics). With the addition of the birch shell over the stage, the sound will be better than ever. The hall will have 311 removable seats, designed by Michel Dallaire, on the parterre level, and 133 seats using the original pews (now with cushions) on the balcony. The interior was designed by a team of architects, supervised by Matthieu Geoffrion, in collaboration with Christiane Michaud, designer, who acted as a consultant in the selection of colours and textiles, whose joint research with the Museum’s curatorial team ensured that the heritage elements in the hall were respected. Bourgie Hall boasts two new Steinway pianos from New York, two harpsichords and a chamber organ with twelve stops, two manuals and pedal, built by Hellmuth Wolff. Even before its opening in fall 2011, some 125 concerts have already been programmed by the Arte Musica Foundation and by private organizations, confirming the community’s interest in a hall of this type, which is both intimate and spectacular. 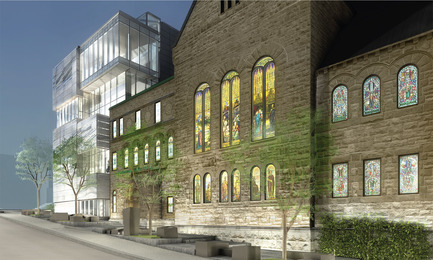 The public will be able to access the Claire and Marc Bourgie Pavilion and the concert hall by a new main entrance through the former crypt, which has been transformed into a lobby that opens directly onto Sherbrooke Street (ticket counter, cloakroom and bar‐boutique) and to the rehearsal room and artists’ dressing rooms. This entrance is clad in the same marble as all the Museum’s pavilions. There is something utterly unique and original about the Museum’s architectural evolution. While most museums in Europe and North America are located in homogeneous, contiguous spaces, the Montreal Museum of Fine Arts developed as a series of pavilions, a concept that shaped its personality and its image. Indeed, the history of the Montreal Museum of Fine Arts is that of a museum that has adapted to a constantly changing urban environment. For more than 150 years, the Museum has developed, expanded, pavilion after pavilion, like a small city within the city. Its buildings serve as an overview of Montreal’s architectural history; the Museum consists of a group of buildings that attest to the city’s architectural diversity. The Museum’s sculpture garden, which dates back to 2002, will expand and will become one of the largest collection of public art in Montreal. Over twenty works will be installed in this garden, accessible to the public on Du Musée Avenue and Sherbrooke Street. They will help define the boundaries of this new four‐pavilion museum complex. New works will be added to those already on display, by such artists as David Altmedj, César, Aaron Curry, Jim Dine, Barry Flanagan, François‐Xavier Lalanne, Fernand Léger, Jaume Plensa and Colleen Wolstenholme, among others. The Ville de Montréal will create a high‐quality urban environment for the Museum complex that is both distinctive and homogeneous. In addition to improving the comfort and aesthetics of the outdoor spaces and integrating public artworks, the City is taking steps to improve pedestrian safety in the vicinity of the Museum. This work will begin in May and will be completed this fall. On Level 3, visitors who look out through a glassed‐in bay will see a new work by Dominique Blain, entitled Mirabilia, which will be installed on an outdoor terrace. This Montreal artist was the winner of a competition presented as part of the policy of integrating art into architecture. “The model of this work is inspiring: the cemetery of a vanished museum attached to the dome of the restored church, with numerous artworks that were destroyed or have disappeared, the shadow or light of a collection seen in negative, like the walled graveyards that nestle against the apse of a church,” said Museum Director Nathalie Bondil. Referring to the architecture of the Museum’s three existing pavilions, Blain designed a series of glass blocks lit from within, resting on a bed of stones that will cover the entire surface of the new pavilion’s terrace. From the third floor, they will resemble the topography of a city. From the fourth floor, they will hint at the imprint of lost objects. “While the Museum’s role is to conserve works of art, Mirabilia evokes those that could not be conserved. They reappear in this small, walled garden, a sort of glass palace the opens onto the city’s rooftops,” explained Blain. 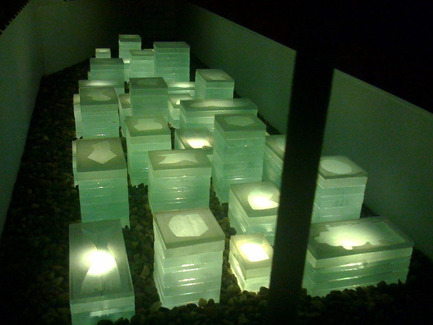 Brought to life by natural light during the day, the blocks are lit up at night. The MMFA’s management is proud to announce that the schedule for the project has been respected. 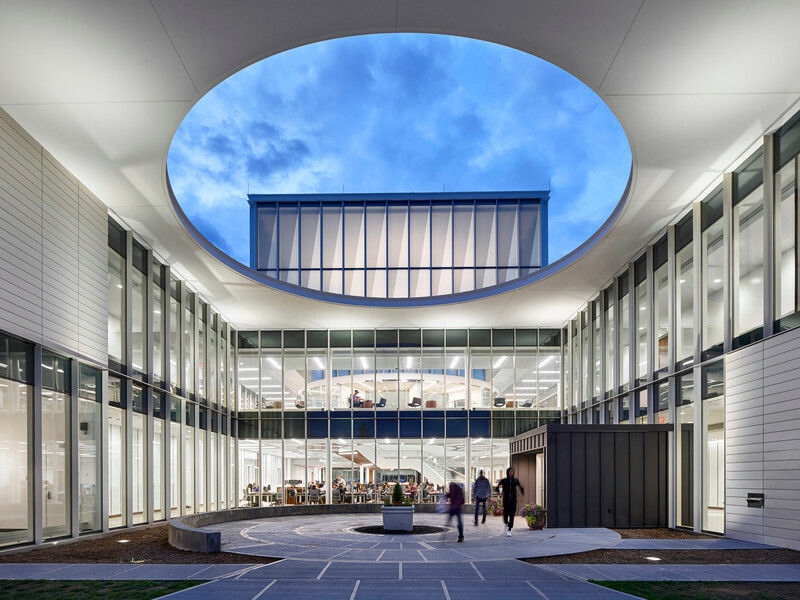 As well, this complex and sophisticated expansion has been completed within the limits of a judicious budget. It should be mentioned that the construction costs for this pavilion were exceedingly low for this type of project ($580 per square foot), thanks to the rigorous management of Paul Lavallée, the Museum’s Director of Administration. The total cost of building this fourth pavilion, as approved by the Museum’s Board of Trustees, is $33.8 million. 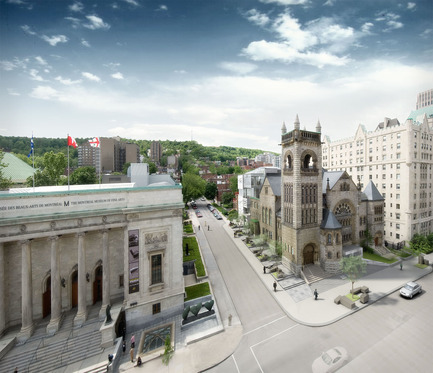 The Montreal Museum of Fine Arts offers its special thanks to the Government of Quebec for its solid support of this project ($19.4 million) and to the Government of Canada ($13.5 million). 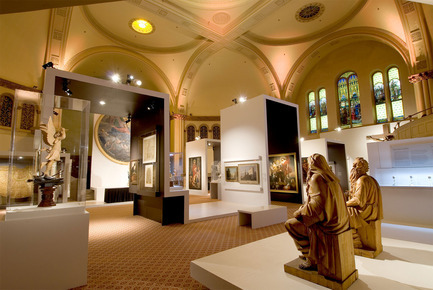 Along with the financial assistance provided by the two levels of government for the construction of the Pavilion of Quebec and Canadian Art, the private sector donated $900,000 towards the construction and financed other costs related to the project, such as the purchase of the church, the restoration of the stained glass windows and the acquisition of equipment for the pavilion and the concert hall, for a total of $7.9 million. In addition, the Museum has innovated by establishing a $14 million self‐financing fund; revenues from this fund, which was raised from the private sector, will cover all of the new pavilion’s operating costs. This method of self‐financing is exceptional. Contributions from the private sector (individuals and corporations) total $22.8 million, or 41% of the total production and operating costs of this major project. The Museum offers its deepest gratitude to all those who contributed, notably Hydro‐Québec, Power Corporation of Canada, Reitmans, the National Bank of Canada, Pierre and Andrée Lessard, Bombardier, and especially the Bourgie family of Montreal, who provided exceptional support for this great project from the very beginning. 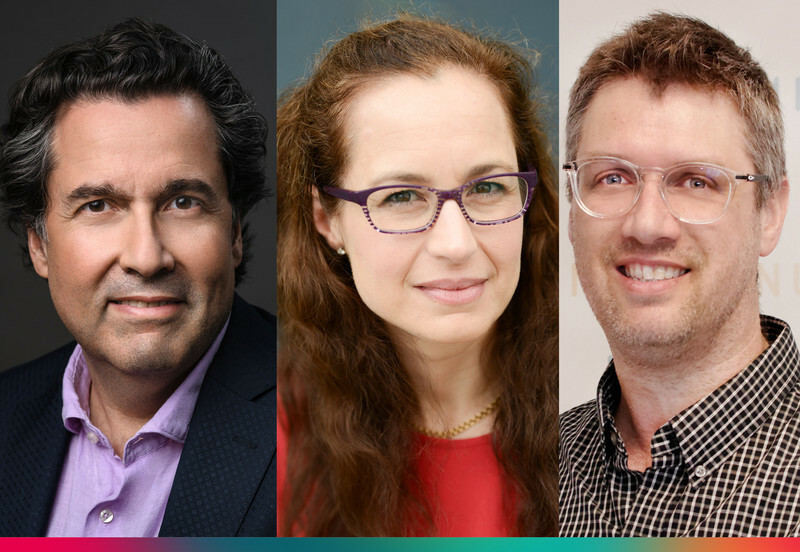 The Museum’s management would like to thank Claire and Marc Bourgie, as well as Pierre Bourgie and Claude Bourgie Bovet, for their extraordinary generosity, which illustrates their passion for art and the importance they place on culture in Montreal. Illustrations are available on the Museum’s website: mbam.qc.ca/media.